Cole Madison and Luke Falk were the only two WSU players drafted in the 2018 NFL draft, but here's a look at where some of the others might end up. Hercules Mata’afa went undrafted in the NFL draft, but it didn’t take him long to find a home. About an hour after the conclusion of the draft, Mata’afa announced on Twitter that he had signed with the Minnesota Vikings. 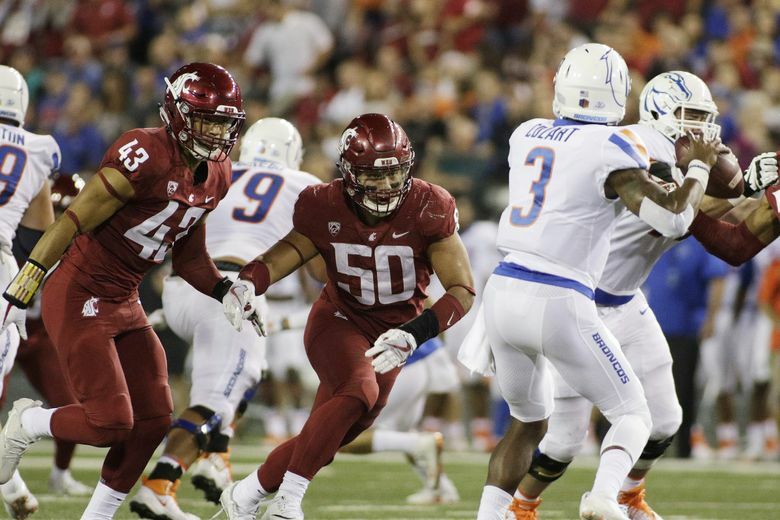 Mata’afa left WSU after his junior season to enter the draft, and was invited to the NFL combine. But his relatively small size and the likelihood that he might have to switch from defensive line to linebacker – a position he has not played – could have factored into him going undrafted. DT Daniel Ekuale signed with the Cleveland Browns over an offer from the Oakland Raiders. Ekuale said the Raiders – who drafted Shalom Luani in the seventh round last year – were the first team to call toward the end of the draft. But he ultimately signed with the Browns instead in part because he might have a better chance of making the team in Cleveland since the Raiders just drafted two defensive tackles. LB Frankie Luvu signed with the New York Jets as a UDFA. Luvu will join a defense that features former WSU DT Xavier Cooper, who signed with the Jets in February. Kicker Erik Powell has minicamp invitations from the Oakland Raiders and the Houston Texans. OL Cody O’Connell has minicamp invitations from the Colts, Chiefs and Washington. RB Jamal Morrow has minicamp invitations from the Seahawks, Cardinals and Washington. He will, apparently, try out for the Buccaneers at their rookie minicamp. LB Dylan Hanser has a minicamp invitation from the Atlanta Falcons. RB Gerard Wicks tweeted that he will join the Saints, likely as a minicamp invitee. This post will be updated as more WSU players sign with NFL teams.